Based on the Nickelodeon movie of the same name, Jimmy Neutron: Boy Genius follows the adventures of a whiz kid and his robot dog, Goddard. 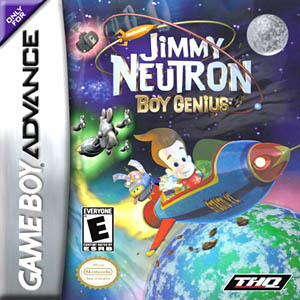 Jimmy Neutron: Boy Genius tells the story of a 10-year-old boy who, along with his robot dog, Goddard, battles evil, rescues his parents from aliens, saves Earth, and still makes it home in time for supper. The game features tons of techno gadgets, including a laser gun, shrink ray, asthma spray, and missiles. There are multiplayer character abilities for Jimmy, Goddard, Carl, Nick, Dad, Cindy, and Ultra Lord. Areas include Retroville, a meteor storm, the Yokian moon, and a Yokian chase through space.